I'm trying to understand the diode output power specs and how that relates to supply power. If we take one of the p73 images from DTR as an example, the current of 1.3A produces an output of 1.105 W (image below). Given the diode has a 2.2V drop, power to the diode as I understand is 2.86W. Does this 1.1W beam power mean that there is a loss of 1.7W as heat? What are the implications of this for a TEC in terms of sizing. Is a 2W TEC suitable for example. In the same vein, looking at these numbers you can see just how much better diode are (in terms of efficiency) when compared to gas lasers. But yeah, diodes typically run at 30 to 40% efficiency, which doesn't sound too great until you look at the alternatives! Thanks guys. Just to clarify, does my TEC logic stack up in terms of sizing? I would err on the side of caution and up-size the TEC. I'm assuming you'll have it on a basic thermal controller, right? So there's no harm in having a larger TEC - it will simply operate on a lower duty cycle. Also, make sure that you are reading the spec sheet for your TEC correctly. Do not confuse the power consumption of the TEC with it's capacity to move heat. Qmax is normally the spec for maximum heat transfer assuming 100% efficiency, but understand that this is the ideal case and your real-world results will be worse than this. Finally, remember to design your baseplate / heat sink such that it can dissipate not only the power draw of the TEC but also the heat load it will move. So if you have a TEC with Qmax of 5 watts that draws 5 volts at 1.5 amps, you have a theoretical max heat load moved of 5 watts, plus the power draw of the TEC (5 volts times 1.5 amps, or 7.5 watts), giving you a total heat load on the baseplate (or heat sink) of 12.5 watts. Gotcha, yeah planning PI control. Thanks for explaining Adam. 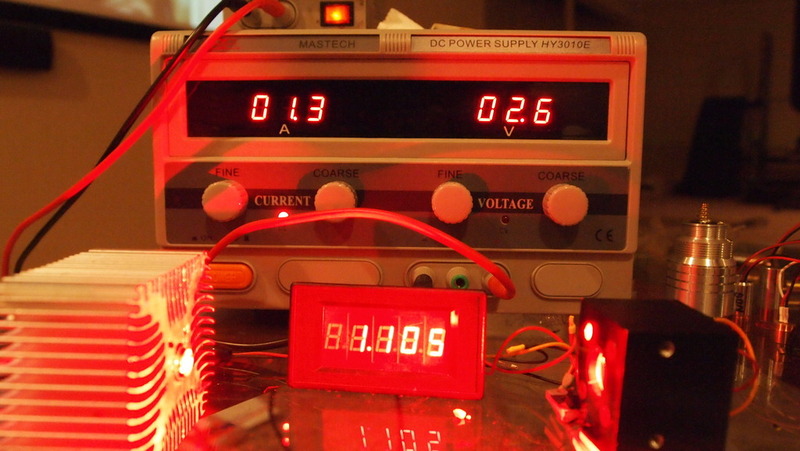 Heat and light are related but in order to know the difference you need to measure total electrical power and light output and then the efficiency of the diode. It’s better to assume the full electrical energy is turned to heat and then double it to pick a tec. You need to be able to overcome the inertia of the heat and cooling if you want a constant temperature. It’s really just like the scanner power example I used but now your chasing heat instead of movement. If all you want to do is cool it but don’t care how far it’s cooling and you should for condensation, it’s much easier to just cool. If you want to just hold, your tec needs to run both in cooling and reverse heating mode and cycle. You can measure the diode temp and then use a switch to tell the tec to shut off when you get close to freezing. Not sure if it exists for this simple application but you could also measure dew point with a humidity sensor and then use that for control unless again you want a specific temperature. Dew form well above freezing. Another and better method is a box over the diode and pump in dry air or dry nitrogen. It is unlikely you will drop the temp on the box window below dew point but it is possible. short answer. 4a diode at 4v=16w. Assume steady state always on. P=IE Chose 32w tec. It doesn’t have to run all the time or even near full power but you have headroom. if you want a real treatment of this hit goggle and be prepared for some math. All times are GMT -8. The time now is 14:25.